ORGANIZING THE EVENT AND HELPING US PLANT THE TREES! Below is info about the tree orders. CAMPAIGN TO SHADE GARDEN DISTRICT! to be planted by volunteers. 2. Free trees must be planted within 12 feet of the curb. 3. Choose your tree(s) from the list below. 4. Complete the online submission form by NOV. 19, 2017. 4. Agree to water trees as instructed and as needed until established. 5. Be present on planting day, Saturday, DEC. 9, 2017! Trees will be planted with a shallow basin for water harvesting. Tucson Clean and Beautiful will arrange for your site to be Blue Staked. Volunteers from Rotary Club, Tucson Clean and Beautiful, and Garden District neighborhood volunteers will plant the trees. Click HERE to see photos and more information about the choices of trees. planted through this event. Call 520-791-3109 to order. RENTERS -- please contact your landlords and share this information with them. 1. I understand the tree(s) will be planted in the right of way (within 12 ft of the curb) on DEC. 9 with volunteers to assist. 2. I agree to provide the tree(s) supplemental water as instructed and as needed until the tree(s) are established in 1 to 2 years. 3. 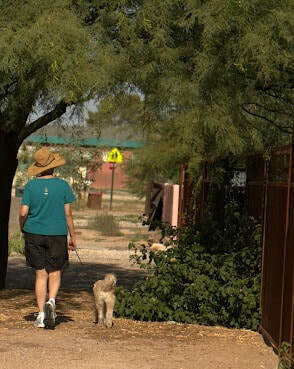 I agree not to prune the tree(s) and will allow the Trees for Tucson Tree Tenders to developmentally prune the tree(s) during tree maintenance events.